This morning I tiptoed out of our cabana before the rest of my family was awake to write a post. Normally I'm terrible in the mornings but, it seems when I have a fresh pot of coffee and this view waiting it's not so difficult after all (think I'm going to get a shock when I return to Sweden!). Speaking of the North, I couldn't resist sharing one more home tour from Carina Olander's fab photography portfolio (did you see yesterday's post?). This Funkis style home in Karlskoga belongs to Anna, Andreas and their children and is a stones throw from Möckelsjön lake, with it's sandy beaches and beautiful parkland. The space has been simply decorated for a lovely relaxed vibe. Photography: Carina Olander, shared with kind permission. Styling: Anna Truelsen / Hus o Hem. I love the white and wood mix - beautiful! Get the look: New York 'my guide to manhatten' poster, Smeg fridge / freezer, Source a vintage Poul Henningsen PH5 pendant light here, classic Swedish brass candle holder from 1950's, dark blue linen bedding (this is so beautiful! ), perspex storage boxes. How about this dark green velvet sofa and some fab plants...? 4 charming children's rooms with a vintage look (that will fit with the rest if your home). 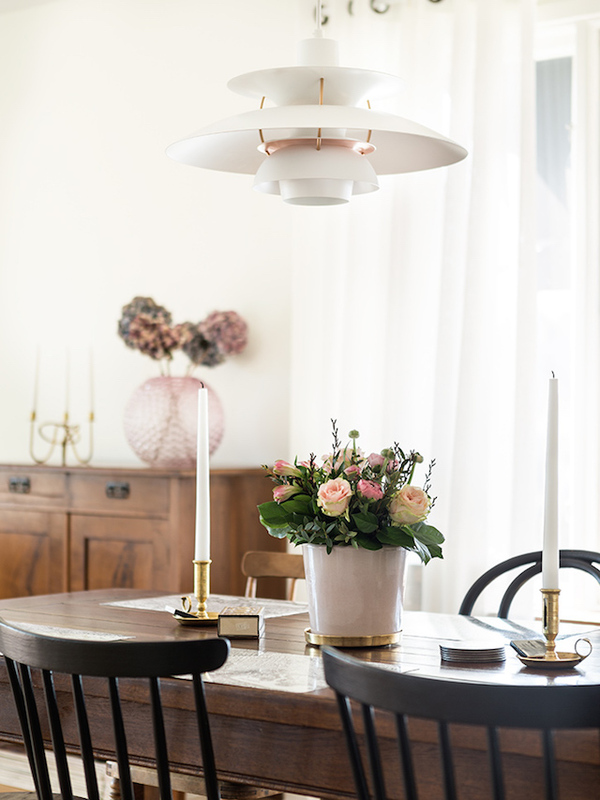 There's that black Mooi lamp again (also seen in yesterday's post) - we're starting to see more black Z1 pendant lights too, like the one in this fab dining room. How appealing does this coffee and book in bed look right now?! How pretty are these fox gloves against the blue? Right, better go off and wake the crazies! Lovely! Have a nice day! Just find your blog. Thanks for the inspiration! Love the dining table and chairs! Me too, they're lovely aren't they! The bedroom and the open closet are such a nice clean look. Thanks for the ideas!